Electrical: High output amp alternator. High-idle system. Dual batteries. A. Additional paint, graphics, lettering, etc. available at cost. Call or email for more inquiries and quotes. B. Other seats available for swap. Call to discuss options and costs. C. Wheelchair lift can be removed and additional seats or storage racks installed. DEALER INFO: Bus offered for sale by Capital City Transit, LLC. Capital City Transit is a dealer of New and Used Buses, Commercial Vans, Wheelchair Accessible Vehicles, and work vehicles since 1946. Additional information about Capital City Transit and IndyBusSales.com: We offer many NEW and USED buses. ALL of our new and used buses are pre-inspected before sale by our ASE certified mechanics and should pass any DOT/State inspection. 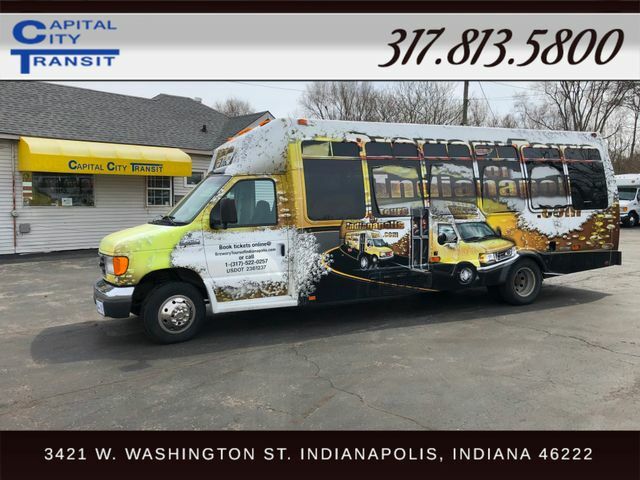 Many of our buses include CHURCH BUS, NURSING HOME BUS, WHEELCHAIR BUS, AMBULETTE VAN, an ADULT DAY CARE CENTER BUS, CHILD CARE CENTER BUS, TOUR BUS, LIMOUSINE BUS, COLLEGE BUS, FAMILY BUS – as you can see, we sell a bus for any purpose! We have even sold buses for animal transportation, funeral home transportation, mobile barbershops, mobile salon, mobile FOOD TRUCKS, mobile home (RV), and much more!. Many of the conversions and accessories are done right here at Capital City Transit. We are the only dealer in the state with the capability and the facility to do such conversions. You see your vision for a bus and we can make it happen! Areas served by Capital City Transit and IndyBusSales.com: We try not to limit our customers to one area or territory. We have sales in all 50 states including Hawaii and Alaska. Many of our buses have also gone to Canada, Saudi Arabia, Africa, Central America, and other areas of the world. We are not limited to one area or territory. We can help you get your next bus or vehicle where it needs to go!